These plastic mounting brackets allow you to easily and securely mount the ubiquitous 10 mm x 12 mm x 26 mm metal gearhead motors first popularized by Sanyo’s 12GN series (e.g. NA1S…NA3S), such as ourmicro metal gearmotors and the Solarbotics mini metal gear motors (GM12a, GM13a,GM14a, and GM18). 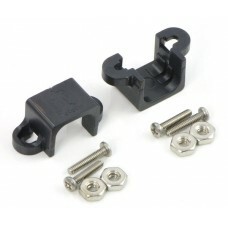 We offer these brackets in black plastic and white plastic. and we offer an extended version that might work better for particular applications. Micro metal gearmotor mounted to a piece of clear acrylic with mounting bracket. These brackets have mounting holes that are very close to the output shaft end of the motor, which could cause mounting difficulties if your wheels have recessed hubs like the Pololu Wheel 42×19 mm. For such applications we recommend the extended version of this bracket. Note: This bracket also works with the 1000:1 micro metal gearmotors, but because of its longer gearbox, it does not fully enclose the exposed gears the way it does on the other micro metal gearmotors.